Having three children, I have found it difficult to find an advent calendar that could be used for multiple children without having to make each child take a turn in a rotation. Last year, we used a Playmobil advent calendar, which had one or more items in each box meant for a single child, so I ended up trying to squeeze 3 candies into each box. That way, even though our children had to take turns to get the toy, they would each get a little treat daily. Like with most advent calendars, the boxes were not designed to accommodate three children, so I had a hard time fitting 3 candies into every box. Because of this, I decided to solve my own problem by making my own advent calendar. I was able to find a couple of the key items at Discount School Supply, where I found the inspiration to make an advent calendar that looked like a collection of books. Books would likely fit into any home's decor and you could even empty out a shelf to house them for the month of December. We decided to put ours on top of a bookcase, but they would also work on a sofa table or a mantel. 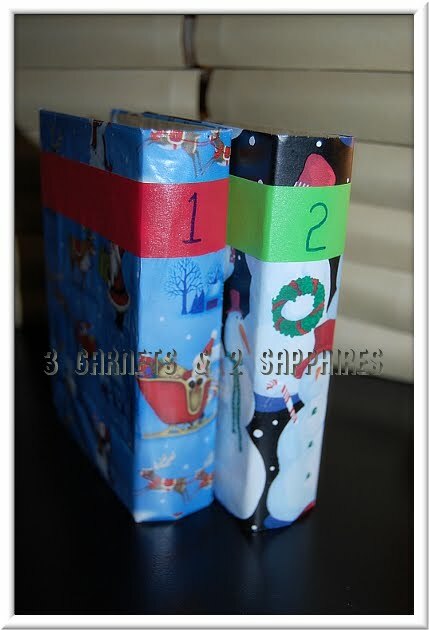 Step 1: Cut a piece of wrapping paper for each book leaving a 1.5" border at the top and the bottom and a .75" border on the left and the right. 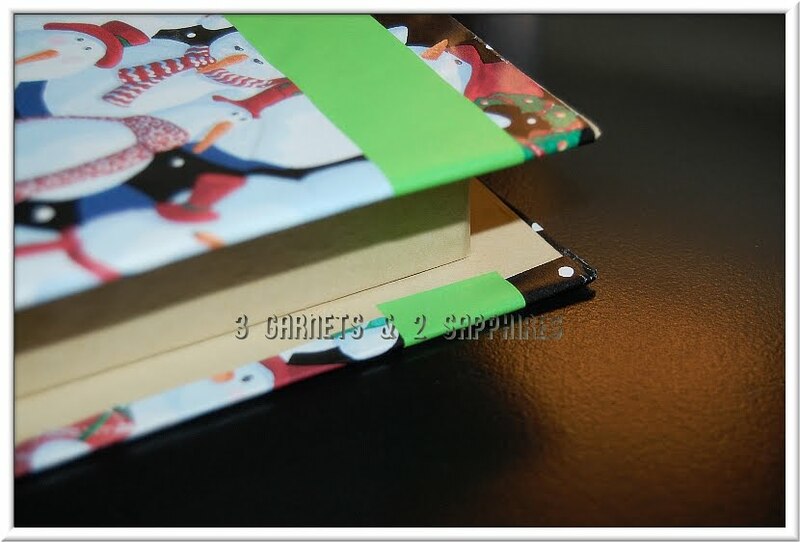 Step 2: With the wrapping paper right-side facing down, crease and fold the top and the bottom, making the entire length of the paper the same height as the book. Step 4: Smoothly wrap the paper around the papier-mache book, leaving some overhang along the edges of the front and back cover. Step 5: Wrap the overhang around each edge, pressing it down firmly in place. Step 6: Use your bottle of all-purpose glue to glue down any corners and edges that need securing. Step 7: About an inch from the top of the book, apply the poster tape starting on the inside edge of the front cover, wrapping it around the outer cover, and ending on the inside edge of the back cover. 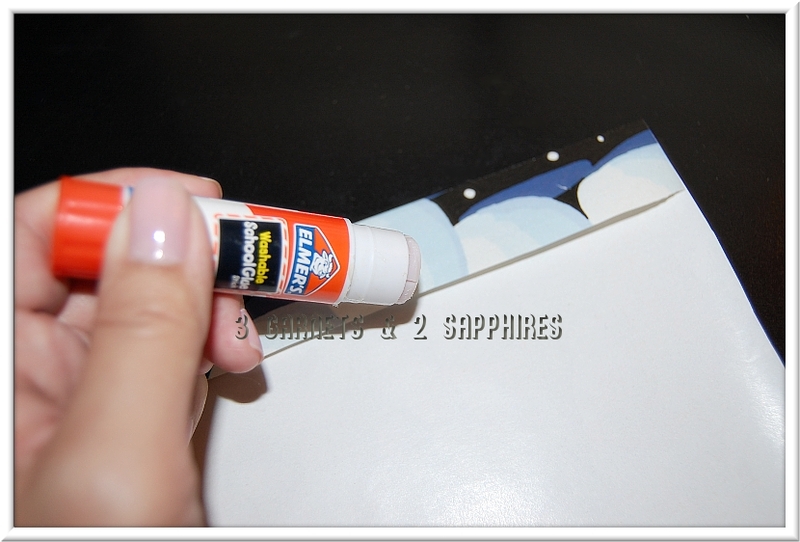 Step 8: Using the permanent marker, write the number "1" on the poster tape along the binding. Step 9: Repeat steps 1 to 8 with the next 23 books, numbering each one a different number from 2 to 24. Now comes the fun part . . . filling each book with surprises for your children. As you can see, these books are large enough to fit Tootsie Roll Pops, so you really are less restricted with what you can fill them with. Decoupage scraps of wrapping paper onto the cover instead of using one piece. 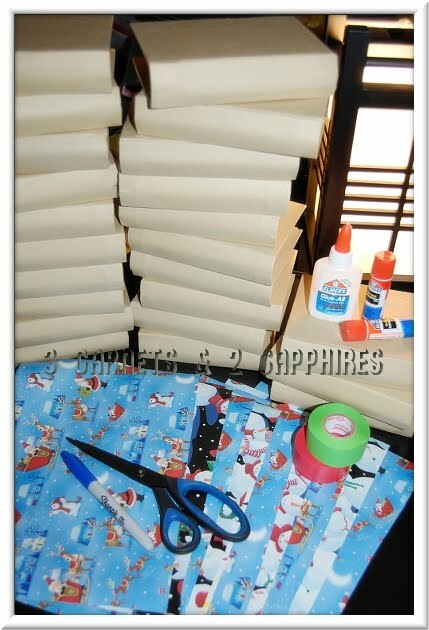 Use fabric to wrap the books instead of wrapping paper. Use calligraphy to write the numbers on the binding. Use decals for your numbers instead of writing them by hand. 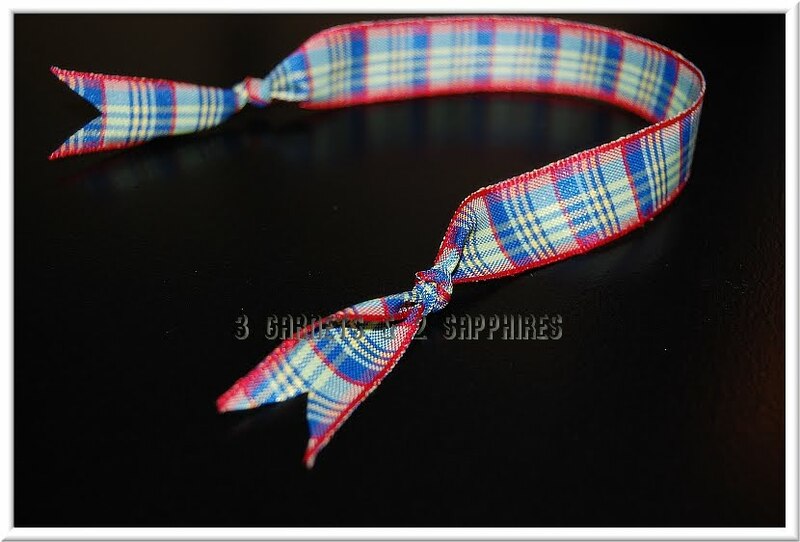 Tie a small charm onto one end of the ribbon bookmark. 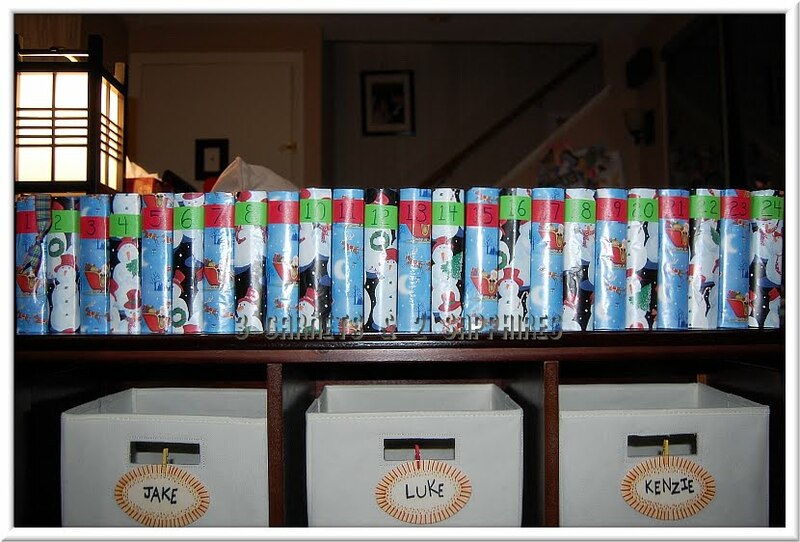 Instead of wrapping the books, have your children paint them and decorate them with Christmas stickers. 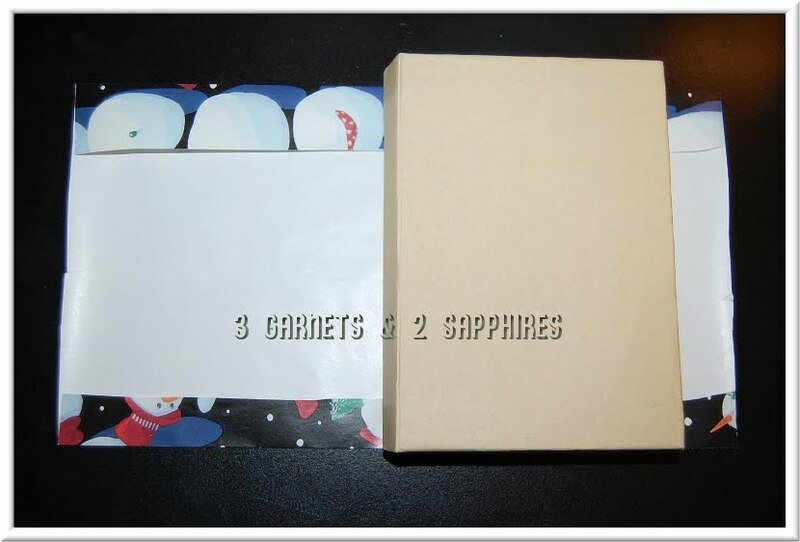 I have to say that my children are very excited for December 1st to arrive so that they can open the first box. You can use these to count the first 24 days in December or reverse the order and use it as a countdown to Christmas. My children opted for the countdown so that they will always know how many days there are to go until Santa pays us a visit. 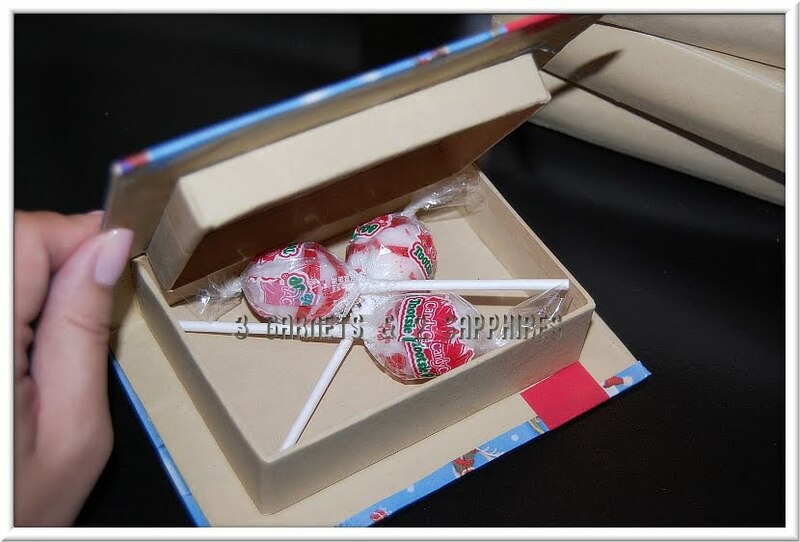 If you are looking for inspiration for craft projects, visit DiscountSchoolSupply.com. That is where I got the idea to use these papier-mache books! Thank you to Discount School Supply for providing complimentary product samples for us to use in this craft project.